"We don't incite violence we only sing about what happens"
The 4Skins formed in late 1979 in the Alaska Rehearsal Rooms at Waterloo. All of the band members knew each other from football (West Ham), as roadies from other bands (Sham 69, Menace etc. ),were 77/78 skinheads and were members of the Cockney Rejects Road Crew (the Rejects song 'I am not a Fool' was originally called Roadcrew and name checked them and the ICF) . There were no instruments, just a few pints and Hodges wrote the lyrics to Chaos and ACAB. Hodges had been a skin since 1977 when he reckons there were only about 30 in the whole of London, including Hitchcock and H. Suedehead Hoxton Tom had played in Barney & The Rubbles. 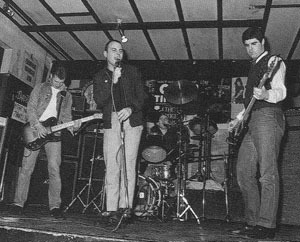 The first line-up (1979-1980) consisted of 'Hoxton' Tom McCourt (guitar), Gary Hodges (vocals), Steve 'H' Harmer (bass) and Gary Hitchcock (drums). 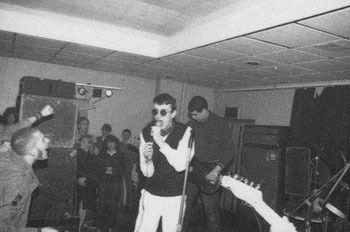 This line-up played their first proper gig at the Bridgehouse, Canning Town in the summer of 1980 supporting the Cockney Rejects and the Damned. Gary Hitchcock couldnt make it so Micky Geggus (from the Rejects) stepped in on drums. They only played three songs (which was all they had at the time!) Wonderful World, Chaos and Jealousy. This line-up also recorded the first two tracks 'Chaos' and 'Wonderful World' for Oi the Album on EMI at EMIs Manchester Square HQ. This session also inlcuded the best ever version of ACAB but EMI refused to consider it for release. H left the band (having to go to court appearance before returning to roadie, full time, for the Cockney Rejects). The second line-up (1980-1981) consisted of Tom McCourt (bass), Gary Hodges (vocals), Steve 'Rockabilly'Pear (guitar) and John Jacobs (drums) and this line-up recorded '1984' and 'Sorry' for the Strength through Oi compliation, the single 'One Law' on their own Clockwork Fun label.and the track 'Evil' for the Carry on Oi compilation. Gary Hitchcock became manager and Hoxton Tom moved to bass. The band had then recruited 'Rockabilly' Steve Pear on guitar (from the Bridge House) and John Jacobs on drums (and anything else!). Before One Law was released, Southall happened, so the single suffered poor distribution in its aftermath, with many shops refusing to stock it. It was "Single Of The Week" in Sounds and sold well. To get back on track, they did a come-back gig at Mottingham Prince Of Wales at the end of August under the name 'The Skans' and with support band The Business billed as 'The Bollyguns'. BBC TV cameras were invited to the gig, and it was shown in part on their 'Nationwide' TV programme. Shortly afterwards, Hodges left the band ... After a further "comeback" gig in Leeds Brannigan's, Rockabilly Steve quit as well (he wanted to go techno). The next line-up (1981-1983) was Tom McCourt (bass), Tony 'Panther'Cummins(vocals), John Jacobs (guitar) and Pete Abbot (drums). This line-up recorded the 1st album 'The Good, The Bad and The 4Skins' and the singles 'Yesterdays Heroes' and Lowlife/Bread or Blood'(produced by Mickey Geggus). Panther was an old skinhead and one of the bands roadies. In addition John Jacobs switched to guitar with Pete Abbott (ex-Conflict) coming in on drums. 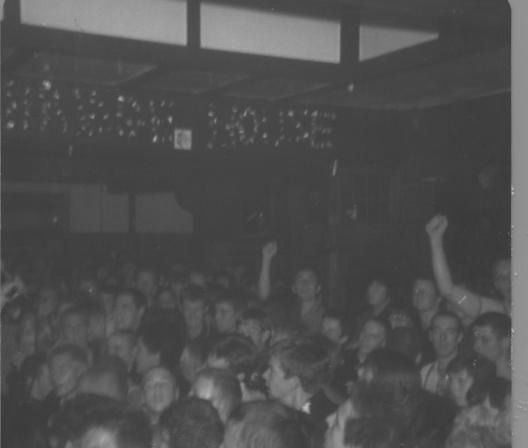 Gigs were still hard to come by though, even though they could sell out places all over the country with no trouble. Eventually Panther left, to become a punk DJ according to music press reports at the time, followed by John and Pete. This left Hoxton Tom on "vocals", "bass", "drums" and "guitar" and the 4-Skins disbanded for a while. The final line-up (1983-1984) was: Roi 'Last Resort' Pearce (vocals), Tom McCourt (bass), Paul Swain (guitar)and Ian Bramson (drums). This line-up recorded the final two albums 'A fistful of 4skins' and 'From chaoe to 1984' and the track 'On the streeets' for the Son of Oi compliation. This version of the 4-Skins recorded the 'A Fistful Of... 4-Skins' LP and the 'From Chaos To 1984' live set, before disbanding for good in 1984. In that time they played about 5/6 gigs in Manchester, Nottingham and Birmingham. Copyright (c) 2004 Tommy Cassidy.